Welcome to this week's newsletter from Zimmer and Peacock. This newsletter is a mixture of news, stories and tech notes from Zimmer and Peacock. If you want to subscribe to our newsletter or have any questions regarding Zimmer and Peacock and our passion for biosensor technologies please don't hesitate to contact us. The owners of Horten's leading curry house receive a live demo of the ChilliPot - Scoville Meter. 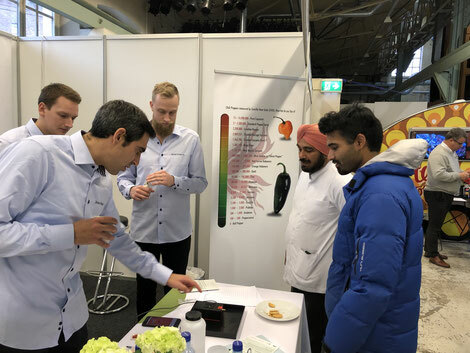 The ChilliPot manufactured by ZP's Chilli Technology Group is the world's only objective measurement of the hotness of foods and products containing chillies. A couple of weeks ago ZP had its company meeting, where we focused on brainstorming and team building. Zimmer and Peacock is a world leader in contract development and manufacturing of wearable biosensors and medical diagnostics. Click the videos below for an insight into our corporate culture.